Update: It was a great show! A Birdman win for Best Picture is one of the Academy's more outlandish choices in recent memory. It's a great choice; I'm intrigued to see how this win looks years from now. 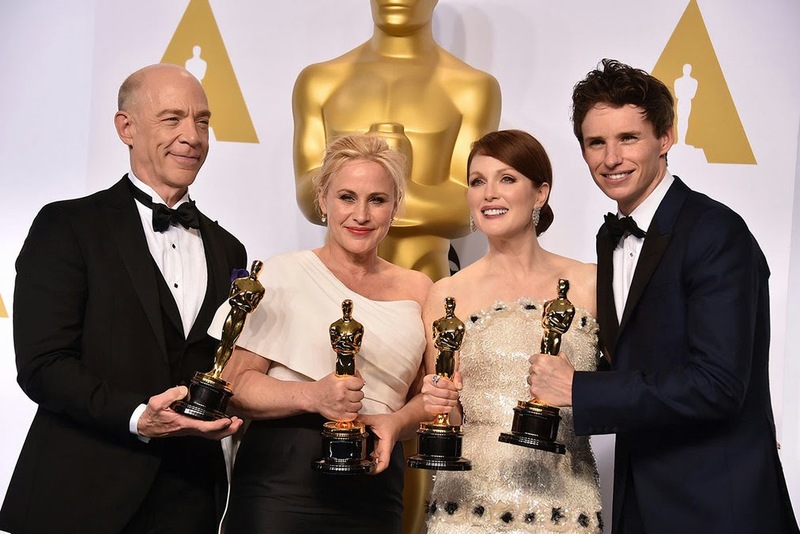 Birdman picked up 4 awards as did Grand Budapest. Whiplash did rather well with 3 wins. The Academy really shared the love: every Best Picture nominee won at least one award. I didn't do as great with my predictions with only 16 out of 24 correct. Better luck next year I guess. Who Will Win: “Birdman.” After having “Boyhood” as my pick for months I’ve officially switched over to “Birdman.” When it comes down to it “Boyhood” could easily win here, but I have to go with the fact that “Birdman” has nearly swept the previous guild awards. No film since “Apollo 13” has lost Best Picture after winning the SAG, DGA, and PGA awards (and we all know “Apollo 13” lost because Rod Howard wasn’t even nominated). The fact that “Birdman” doesn’t have an editing nomination gives me traumatic flashbacks to incorrectly predicting “Brokeback Mountain,” – as no film has won best picture without at least being nominated for Editing since 1980’s “Ordinary People” – but stats were meant to be broken. Boyhood did also win BAFTA, but honestly, flip a coin at this point. And if it were to win, it’d be the closest the Academy has ever gotten, and probably ever will, to rewarding a superhero film for Best Picture. Who Should Win: “Boyhood.” Frankly, I’d be happy if either film won for two main reasons: first, they’re awesomely entertaining and well-made films, and two, they each represent a great leap forward for the Academy. These two films would have never even been in the conversation 10 or even 5 years ago. A part of me wishes even “Whiplash” would win; all three films are some of my favorites of the year. 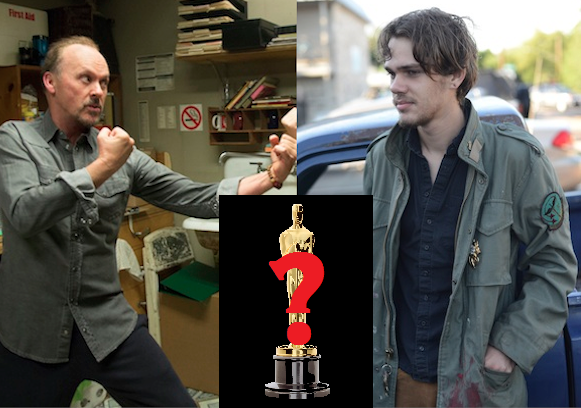 Will Win: Alejandro G. Inarritu, “Birdman.” He surprisingly won the DGA so he’s the odds on favorite to win here as well. Linklater really COULD win, as arguably both would be extremely deserving, but I’m going with history here. Will Win: Eddie Redmayne, “The Theory of Everything.” There hasn’t been this close of a Best Actor race since 2003 when Adrien Brody shocked the world and won for “The Pianist.” Could Bradley Cooper be a surprise winner even though it feels strictly between Redmayne and Keaton? Sure. Redmaybe has won most of the previous awards and he has the benefit of playing a real life person in a respected Best Picture nominee. I always had a sneaking suspicion, however, that if Keaton were to win here than Birdman was definitely going to win Best Picture in a sweep but I still feel like at this point it’s Redmayne’s to lose. Should Win: Michael Keaton, “Birdman.” Oh don’t make me choose. Redmayne and Keaton are both excellent though as many have said what Keaton has done is just dazzling to watch. Will Win: Julianne Moore, “Still Alice.” No contest. (Although the last time the frontrunner was someone who played a character with Alzheimer’s Marion Collitard won, just saying. It won’t happen). Should Win: Julianne Moore, “Still Alice.” She’s been nominated four previous times and has yet to win. Even if her movie is a little scene indie, she’s great in it and actually deserves it. Will Win: J.K. Simmons, “Whiplash.” One of the sure things of the night. Should Win: J.K. Simmons, “Whiplash.” And he deserves it. Will Win: Patricia Arquette, “Boyhood.” Whether “Boyhood” wins Best Picture or not, this is at least one guarantee win for the film. If Arquette can’t even win this, there’s no way it’s winning Best Picture. Should Win: “Patricia Arquette, “Boyhood.” The movie could have easily been titled “Motherhood.” Arquette gives a great, realistic and rather natural performance and remains the heart of the entire film. Will Win: “Whiplash.” The frontrunner really is “The Imitation Game” is really the most obvious likely winner, though I’m uncertain how much love the Academy is going to give it. It’s won some screenplay awards so far, but has yet to go up against “Whiplash” which the Academy has placed here instead of in Original Screenplay. Sometimes indies find love here, like “Precious” a few years back. Is “The Imitation Game” going to be this year’s “American Hustle” and go home empty handed? It’s possible, though if it wins anything it does here. Will Win: “The Grand Budapest Hotel.” The Academy might as well call Best Quirky Screenplay as so many strange and unusual, but brilliant, films have deservedly won this category. “Birdman” COULD win here, but films with multiple writers (there are four here) are a rarity in these categories for some reason. If “Birdman” really is going to win best picture, I feel like it could end up taking this too, but Budapest seems most likely. Will Win: “How to Train Your Dragon 2.” Much has been already been said about “The LEGO Movie’s” shocking snub so I won’t go into that, but I believe it’s basically a race between Disney and DreamWorks. I give the edge to “Dragon” because if “Wreck-It Ralph” can’t win then “Big Hero 6” can’t. Will Win: “Birdman.” No contest. In a perfect world, Roger Deakins would finally get his due and take home a deserved Oscar for “Unbroken.” However, the nominees’ names aren’t on the actual ballot, therefore the year’s most obviously amazing cinematic achievement will take it, giving Mr. Lubezki’s second win in a row. Will Win: “The Grand Budapest Hotel.” I can see arguments being made for other films like “Into the Woods” or even “Maleficent” but those movies aren’t nearly as respected as “Budapest.” There’s also a strong link between this category and Production Design where it’s also almost guaranteed a win. Will Win: “Citizenfour.” The Documentary branch made a big mistake in snubbing “Life Itself” which would have been the presumed frontrunner. “Citizenfour” is arguably the most well-known of the nominees and feels “important.” Though arguments for the other films could be made. Will Win: “Crisis Hotline: Veterans Press 1.” Your guess is as good as mine. Will Win: “Boyhood.” I’m so conflicted about this one. Honestly, it baffles me that “Birdman” isn’t here, but it doesn’t have obvious editing since the film is presented as if it’s shot in one take (which it isn’t). “Boyhood” isn’t the flashiest of edited films but it has twelve years of footage edited down into a coherent feature. And there’s “Whiplash” the more obviously edited film that many people seem to like. It could go either way. Last year I went on a limb predicting “Captain Philips” and it didn’t turn out that way, so I’m going with “Boyhood.” This is going to be a key category to watch on Sunday. If “Boyhood” does win, it very well could win Best Picture. If it loses here, there’s no way it’s winning the big prize… which makes me wonder why I’m picking it here in the first place. Will Win: “Ida.” There actually isn’t that one obvious choice this year. “Ida” did get some other love in the Cinematography category but there’s no real popular frontrunner. I’ve also heard good things about “Wild Tales” which some people seem to be selecting. Will Win: “The Grand Budapest Hotel.” If you’re going on sheer amount of impressive makeup then “Guardians” would take this, and it could since it’s a populist movie that everyone seems to like (and the similar Star Trek won this award before) and the work on “Foxcatcher” is subtle and extremely impressive, but at the end of the day I think they’ll reward the more respected film which features lots of facial hair, birth marks, and old age makeup which otherwise makes this a shoo-in. Though, and you heard it hear first, anything can happen here. Will Win: “The Theory of Everything.” I’m not 100% confident here but my rationale is that Alexandre Desplat will split his votes between “Imitation Game” and “Budapest;” Hans Zimmer’s “Intersetellar” score is amazing and was talked about a lot when the film came out but overall buzz for the film is down. And the guy who got a surprise nomination for “Mr. Turner” is happy to be nominated. The Academy has a strong record of rewarding new nominees in this category and that would be Johann Johannsson. Will Win: “Glory” from Selma. Many think this is a race between general snubs “Selma” and “The LEGO Movie.” I’ve heard rumbles of Glen Campbell getting the sympathy vote, but I think “Selma” will take it. Will Win: “The Grand Budapest Hotel.” I’d genuinely be surprised if anything else won. Will Win: “The Dam Keeper.” Many are predicting another win for Disney with “Feast” which was shown in front of “Big Hero 6.” But besides the win for “Paperman” a couple years ago, Disney rarely wins here which is why I’m going with a different but similarly animated film. Will Win: “Boogaloo & Graham.” Your guess is as good as mine, it’s got cute kids and baby chickens. Though many are predicting “The Phone Call” mostly because it features well-known actress Sally Hawkins. Will Win: “American Sniper.” This seems the best logical place to reward this film. Loud films do will here, as so war and action films. This makes sense to me. Will Win: “Interstellar.” Usually a best Picture nominee ALWAYS wins here, though there is no Best Picture nominee in this category (a first since 2007 when “The Golden Compass” triumphed over “Transformers”). “Interstellar,” however, feels like the only Best Picture nominee of the bunch, since it does have a total of five nominations. “Dawn of the Planet of the Apes” is the only other one I can really see winning, since the other films will split the comic book vote.